September started out with a bang for us with the visit of Jesse’s sister Anna… when Anna comes, it always means it’s time to work! We tried to show her a little bit of fun too, but she stayed for 10 full days and we got a lot done on the property (which also means we spent a lot of money)! Right after that, my (Alyssa’s) parents came to visit the property for the first time so Jesse and my dad tackled a couple solar projects while my mom and I dove right back into canning! We also showed them around our new home a bit which meant spending a bit of money. Jesse and Anna working on the stairs! My dad retired a couple months ago… he’s doing it right in his Hawaiian shirt and sipping wine on our deck! My mom had fun playing homesteading by canning elderberry stuff and making elderberry ice cream! Financially, we actually got a lot done this month for not a ton of money. A summary is below. The big event of this month was modifying our driveway so that we could get a physical address. Why? We wanted to make sure we could get one prior to building out house and then also so we could get things like drivers licenses in our new state. We’ll write a blog post on the subject, but these driveway modifications ended up costing us around $1,500… just to get a street address. 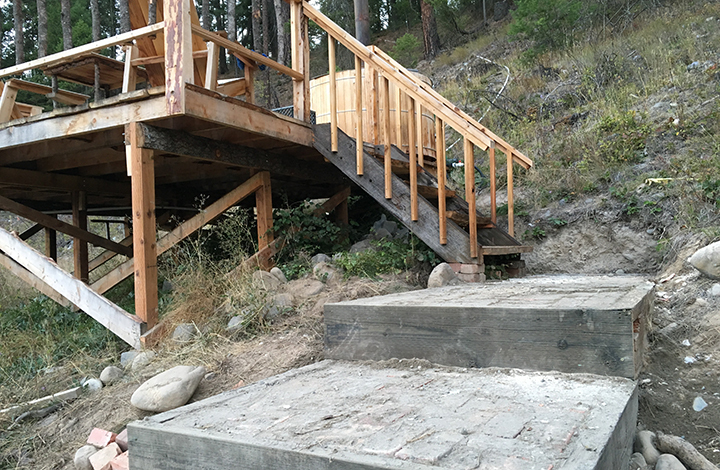 While we had the excavator we built stairs to our hot tub deck. We actually did this with reclaimed materials for the most part, but we had to buy some treated fir for the faces of the stairs as well. In the end, we love the stairs! Oh yea… we also published a video on why we built a hot tub & deck before a house… give it a watch if you haven’t seen it yet! We continue to work on this month over month, but we got three new panels setup, tidied up our battery bank, and built a tilting mount for the new solar panes. Watch our solar update here. We spent a decent amount of money on quality hardware for everything solar-related, but that’s okay because it’s an investment. This year’s garden sucked to say the least. Because we had the excavator already we figured we could dig footings for the framework of a fenced garden. We also bought 6′ high garden fence, lots of cement, cement forms, and things like that to complete the garden, even though we didn’t get around to it this month. Last winter, we barely squeaked by with our heating setup, but this year we made major improvements! We refurbished a Fisher wood stove, got it installed, and also upgraded to a triple-wall chimney. We’ve already tested the new setup and lets’ just say it’s way more efficient and puts out way more heat. I think we’re golden for winter… ahead of schedule! This wasn’t free though, there were costs involved even though we were able to score many items second-hand. Now… time for the financials! This was a lower month for us food-wise! Because we spent the prior month canning up a storm, we may have saved a little month this month by only buying the staples like meat and veggies. We even fed a guest for 10 days… not bad, not bad! We ate out quite a few times because Jesse’s sister was in town and not only did we have to do a bit of driving around, but we also took a couple day trips. We ate out maybe 3-4 times with 3 people… not bad! Not sure exactly how much we spent on the kitties but we feed them a raw diet which means buying meat about once a month… check out the homemade cat food recipe we use here. This month, we spent $11.00 on shipping and $16.00 on repairing a couple of chairs we bought at Goodwill. Because we had guests in town for 15 days out of the month (WOW! 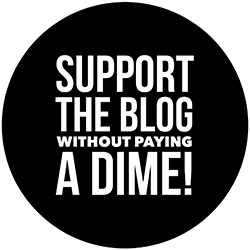 ), we went to our favorite hot springs twice, did a couple historical tours, and paid a bit in parking for said entertainment. Even though our portable solar panels saved us a bit on fuel this month, we also did A LOT of running our power tools as well as running the ATV, so we had to buy fuel quite a few times. It happens. Even though it was summer this month and we didn’t need to run the heater much (we did a couple times towards the end of the month), we still canned quite a bit on our three-burner stove, so we had to spend a little on propane. Check out our water solution progression… but we fill up our 650 gallon cistern twice every month, and that is extremely cost-effective! Yay! Not sure exactly what laundry was but $20 sounds like a good number. We didn’t do too much outside work so our clothes weren’t that filthy overall! Our fuel was somewhat high this month because we drove to Canada twice and to a large city once… plus did lots of other running around for projects. * This includes anything related to vehicles that we drive. We rented an excavator twice this month, 8 hours on the clock each time. We feel we got our money’s worth out of it which was nice. We wrote a post on what it’s like to run and rent construction equipment… check it out, good stuff if you’re new to equipment rental! We bought these for our driveway and we got them at a 50% discount if not more because the company was moving and needed to get rid of them so they didn’t have to move them! In the end, they were smaller than what we were told, so we really didn’t get enough to finish the job. Oh well, maybe we can get more later. We had to get this to pave the new section of the driveway. This was 11 yards plus delivery. I have nothing documented here for this month. I’m sure we spent something on consumables… but not sure what. Had to buy new blades to sharpen the chainsaw chains as well as a new handle for the sharpener. This is random hardware to upgrade our solar power setup and I think we had hardware for our diy hot tub insulated cover and even the hot tub deck (finishing touches). We bought new hardware for the battery bank as well as for mounting our new solar panels. Our neighbors had to kick our huckleberry ice cream out of their freezer to make room for hunting meat, and we had power available to us as a result of upgrading our solar setup, so we invested in a chest freezer! It also gives us the option to keep more food on hand which is a huge bonus. I swear we spent more than this… but I can’t find any more receipts. The hard part with projects like this is that we frequently buy and return a lot of stuff, so it’s hard to keep track of the true expense. We feel that this month we did a great job of completing jobs with what we had instead of running out to buy something for our every need. We did spend a lot of money, but trust us, it could have been a lot more. We also feel that our asset list has grown a lot in a year and we need to buy fewer and fewer tools to complete projects… just materials. We still have one large project we want to get done before winter sets in (installing our 1,700 gallon cistern) and that should be our last large expense. Then, it’s time to settle down for the winter and expenses should drop like a rock! Winter is money-making time, not money-spending time! Here’s to a great October expense-wise! When you are putting up your garden fence, you may find it very useful to dig down about 3 feet and start the fencing down there. This will keep any small little things ( like voles and rabbits and moles) from burrowing under your fence to feast on your work. I speak from long experience here. I would also suggest that before the winter really starts you ought to look at Lehman’s stove fans. They sit on our wood burning stove and the heat of the stove starts them–no electricity. However, they broadcast the heat from the stove through to our dining room and kitchen–it’s wonderful– and I think they might give you a little more walking space in your quarters–both temporary and final. Thanks for the tip on the fence! And the Lehman’s stove fans look interesting… I sent the link for Jesse to take a look at! We are using two electricity-powered fans now which work well for distributing heat but they sure do take electricity. If we could get away with something heat-powered, it’d distribute heat all night long! Thanks for the tip on the fan. I will have to remember that! Do you guys plan on continuing the expense report?